Maths With Friends: Percentages with Dragons! I don't have many differing resources for Percentages. It's probably up there with basic operations as the most important part of Mathematics to our learners, but since this is the case, there are bags of resources online to support with this. Next is my Dragon's Den percentages: It is for reviewing / revising percentages and there is a difficult one (with various compound interest calculations) and a more simpler one for practising basic increase and decrease. 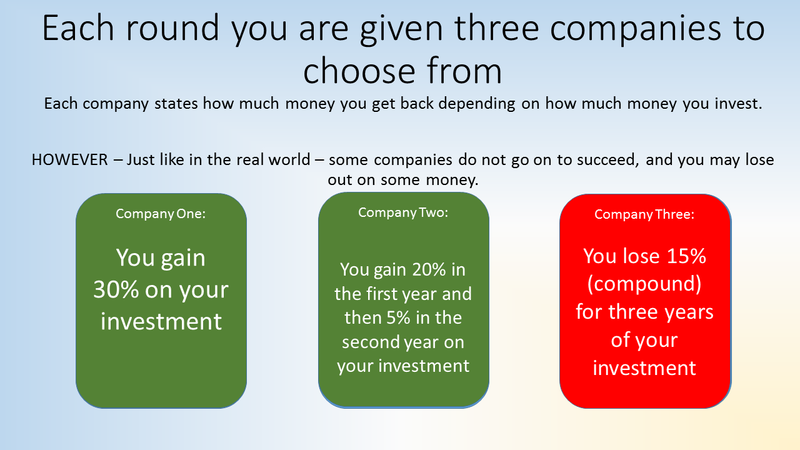 Basically - the students invest a portion of their 10k into a choice of three companies. They can choose to invest in two if they like, but not all three. After everyone has written in their investment choice on the attached sheet, they then work out the money they have made or lost. There is an example on the sheet, but I think it relates only to the higher powerpoint. Also, be warned that I teach to a point where we use multipliers, so if you don't do that you might have to tweak your answer sheet. The biggest obstacle I have run into when running this activity is that students don't carry over the money correctly into the next round. All the companies exist (or have been pitched in the den) - and if I have given them a green, then they have had investment and may have been successful. I trust my students to check each others work each round, and we take time to go through the workings at the end of each round. They will also never run out of money - as they just lose a percentage of their investment. The best round is number two - none of the investment opportunities are worthwhile. The students did not need to invest in any if they don't want! Finally - I'm sure you all know this clip: but it is a great plenary. The teacher doesn't know - but does anyone in your class? The video is available via the link above as well.